If you want to finish a quilt quickly, make a quilt completely on your own, or see what else you can do with your embroidery machine, you will love this class. The Easy-Connect Quilting files and technique allow you to use your embroidery machine to get quilting results like you would see from a long-arm quilter. 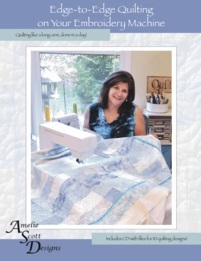 Choose from ten edge to edge quilting patterns.